Just like Batman would be nothing without Robin, every NBA star needs a sidekick to thrive. 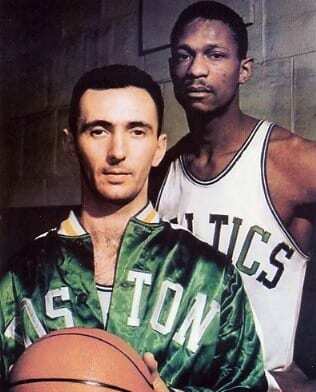 Now, we aren’t saying that every classic duo that ever existed in NBA history works in a hierarchical form. It doesn’t always come in the star-sidekick formula. No, sometimes a powerful tandem that exists on a team are pretty well balanced in how talented they were, and their effect on their opponents thrived as a result. Consider the duo of Karl Malone and John Stockton of the Jazz. They were both legends in their own right, and they both managed to cement themselves into statistical history books. But they each had their own roles, and they worked so well together because the pair of them were acutely aware of the other’s role. Because a good partnership isn’t always about talent – it’s about chemistry. Sometimes it takes time to develop, and sometimes it happens in a flash, like a bolt of lightning. Some of the best basketball pairs of all time didn’t work out overnight. It took a considerable amount of time for them to get to know each other’s weak spots and advantages. Come to think of it, even the stars that naturally got along well right off the bat, also took some time to really get into the nitty gritty when it came to their teammates tendencies. But something is consistent with all of them: when they finally hit that sweet spot, that level of harmony we’re always searching for… the results were always magical beyond belief. In many ways, the pairing of two basketball players on a team is kind of like a marriage. There are all kinds of ups and downs, and not everything will be perfect, even for the greatest of tandems. Consider the first game in Magic Johnson’s entire career. Kareem Abdul Jabbar hit a game-winning shot, and Magic reacted by hugging Kareem in happiness. Magic accounted later that Kareem just looked at him like it was no big deal, and that perhaps he needed to just tone it down a little bit. Magic’s excitement versus Kareem’s business-like mindset. These were two completely different approaches, but the combination of the two managed to produce one of the greatest teams of all time. Such was the case with so much amazing players that the NBA has had the opportunity of employing, and that we’ve all had the joy of watching on screen. And there really is nothing quite like watching a duo tear it up. Because when we see the harmony that exists between two players, an amazing feeling arises within ourselves. We’re reminded about all the things in our own lives that have harmony – and that right there is a wonderful feeling. What better way to kick off the show than with a duo that were the center of Showtime? There were a number of exceptional players on that Lakers team that ran through the 80s, including the likes of Hall of Famer James Worthy, but as far as duos go, Magic and Kareem were the leaders. Consider the fact that Magic holds the all time record for career assists per game, and that Kareem holds the all time record for total points, and you can see the point we’re trying to make. These two are legends on their own, and combined, they were able to win a total of five championships… in an era with Larry Bird. When you talk about the modern day Golden State Warriors, it’s understood that you’re talking about a team that not only revolutionized the NBA, but did it while being one of the greatest teams of all time. On a list filled mainly with duos who were their respective teams obvious star players, we should definitely acknowledge how there are two other future Hall of Famers on this squad, such as Draymond Green and Klay Thompson. 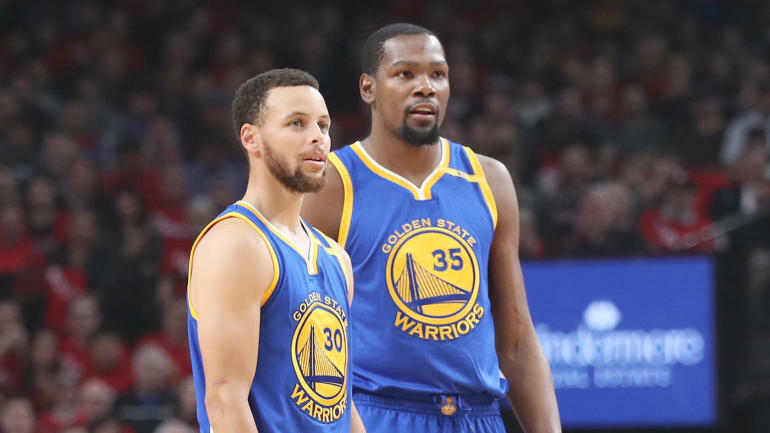 That being said, Durant and Curry are the main top dogs on this team, and it’s crazy to think that they can still add titles to their already impressive collection (Curry has three, Durant has two). In the summer of 2010, LeBron James shocked the world when he announced that he would taking his “talents down to South Beach,” and effectively joining forces with Dwyane Wade and Chris Bosh in the process of eventually winning two championships. 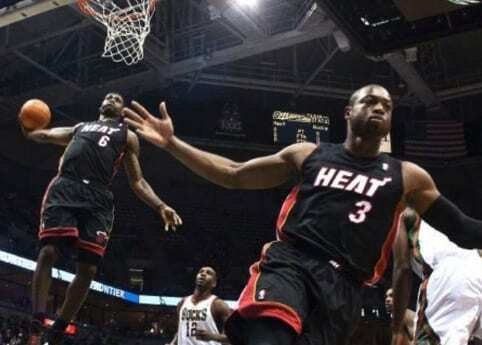 He and Wade are certainly two future Hall of Famers, and some people believe that LeBron is the greatest of all time. The pair were also great friends, which added to their chemistry on the court. Malone and Stockton. It really doesn’t get more classic than that, as far as the perfect one two punch. It’s almost like a love story, in the basketball sense. In their 18 years together on the team, they never missed the playoffs. Unfortunately, their peak came at a time when Michael Jordan was at large, so they also never won a title. Still, Stockton holds the record for total all time assists, and Malone is number two in total all time points. Larry “Legend” as they called him, is one of those all time great players that simply mystified you in a way you couldn’t ignore. 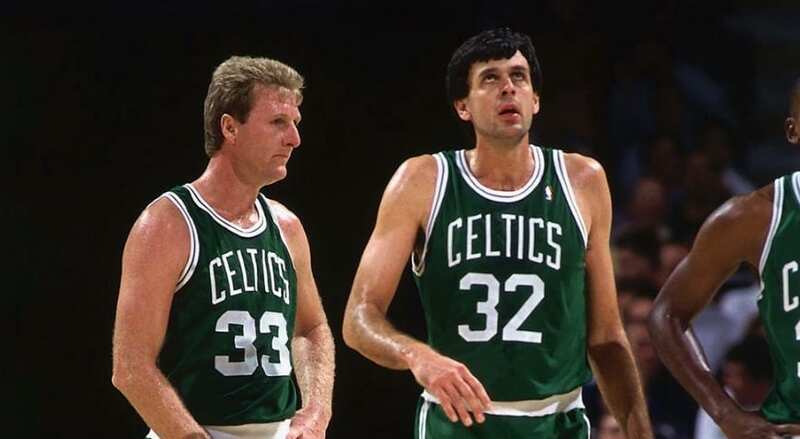 But he needed a bulldozer of a right hand man, and he had that in Kevin McHale. Together, they were able to win a total of three championships, and when you consider the fact that this was during a time that the Showtime Lakers were in the league, these accolades appear all that more impressive. 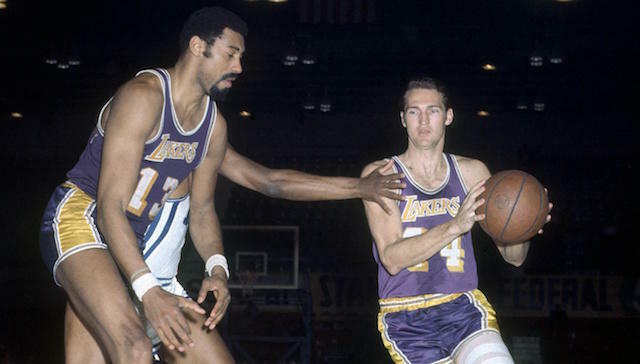 Two NBA Hall of Famers, Wilt Chamberlain and Jerry West had both done pretty well for themselves in the NBA before they finally were able to work together on the Lakers. By the time they were on the same team, it was clear that they would be a force to be reckoned with. It took them a little while, mainly due to the heavy competition in Boston, but they finally were able to win a championship in 1972 (it was Wilt’s second, Jerry’s first). On a team coached by the likes of the legendary Gregg Popovich, Tim Duncan and Tony Parker were the cornerstones of a San Antonio Spurs team that managed to stay relevant for nearly two decades. 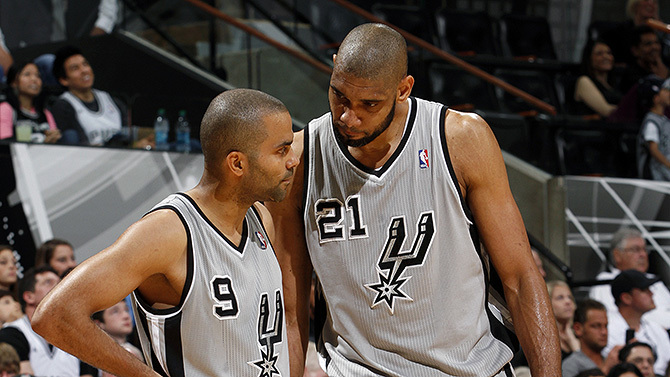 During their time together on the squad, they managed to make it to the NBA finals five times, winning it four times out of those five (Duncan had an additional one before Parker joined the team). They also never missed the playoffs. There are all kinds of arguments that one can make regarding who the best one two punch is, but Bill Russell and Bob Cousy made a very strong one primarily because of how many times they won the ship. Bill Russell won a ridiculous 11 titles, and during his time with Bob Cousy, the pair won six of them. These two were absolutely dominant, and not even the great Wilt Chamberlain could stop them from racking up those rings. When Moses Malone joined a Sixers team that was led by Dr. J in the early 80s, they were a basketball match made in heaven. They went on to win a magnificent 65 games that season, and ultimately swept the Los Angeles Lakers in the finals. Although they didn’t win any more titles in their final three years together, they continued to be sensational. At least they managed to snag that one title when they could. While the Lakers and Celtics dominated the 80s, there were two players that were starting to get pretty fed up with it. They were so fed up that people started calling their team the “Bad Boy Pistons.” Led by Isaiah Thomas and Joe Dumars, the bad boys eventually dethroned the Lakers in 1989, and followed it up the year after that with yet another title. They were nitty, they were gritty, and they didn’t back down from anyone. Before his name was Kareem Abdul-Jabbar, he went by his birth name, which was Lew Alcindor. 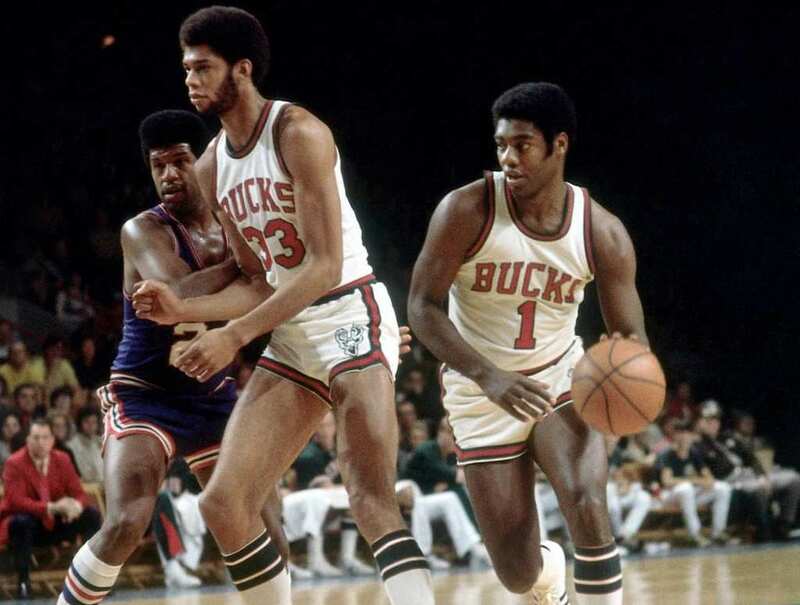 In the earliest years of the Milwaukee Bucks inception, Alcindor had already begun to dominate the league, and once he was joined by Oscar Robertson, otherwise known as the “Big O,” things started to get really exciting. They pretty much steamrolled through every opponent while together, and in 1972, the all-time leader in points and the “walking triple-double” won themselves a title. Here’s another duo that made a pretty big impact during their time in the league together. Before they were the Oklahoma City Thunder, they were actually the Seattle Supersonics, and during the 90s, they had two pretty fantastic players named Gary Payton and gracefully powerful Shawn Kemp. Payton, nicknamed “The Glove,” and Kemp, had some amazing chemistry, and although they never won a title together, people still remember the profound impact they had on the league. The Celtics are one of the most storied franchises in all of sports, and as it stands at the moment, they hold the record for most NBA titles. With Bill Russell controlling the 60s, and Larry Bird controlling the 80s, the Celtics needed a couple players to lead their team during the 70s – and that’s where these boys came in. John Havlicek and Dave Cowens helped contribute their part to the Celtic legacy by adding two titles during their stint, and Cowens even won MVP one year. Even though we’ve already discussed the duo of Timmy D and Tony Parker, we feel compelled to bring up the influence that David Robinson and Tim Duncan had on the league. When Duncan was drafted first by the Spurs out of Wake Forest, he had the perfect mentor waiting for him – David Robinson, AKA the “Admiral.” Together, these two big men were unstoppable in the paint, winning two titles together and showing the league that the Spurs were here to play. The duo we’d like to bring up right now is one of those bittersweet ones. Jerry West and Elgin Baylor are two future Hall of Famers that were able to make it to the NBA Finals a whopping seven times during their stint together on the Lakers in the 60s. Although they couldn’t manage to beat the Celtics (at least not while Baylor was there), it can’t be understated how much these two impacted the league for the better with their innovative playing styles. 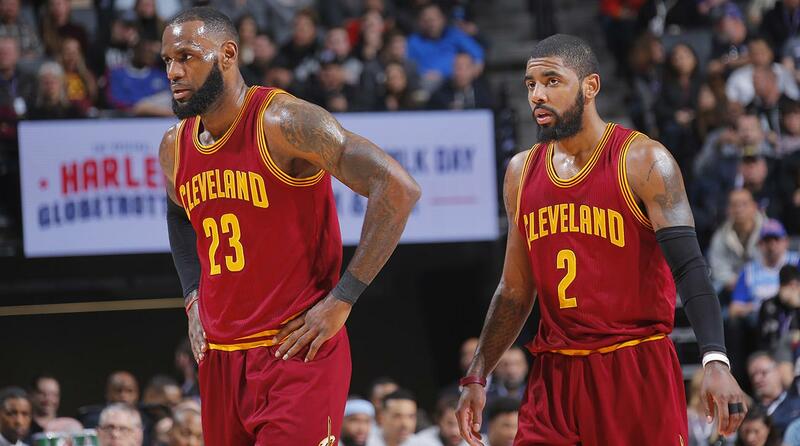 LeBron James and Kyrie Irving were yet another groundbreaking duo, and these guys managed to accomplish something incredible – they beat the modern day Golden State Warriors. Oh yeah, those Warriors had also just broken the record for total wins in a regular season. Oh wait, and one more thing… LeBron and Kyrie brought the Cavs back from a 3-1 deficit in this particular Finals, and still, impossibly, found a way to win three straight games, beating Golden State. There were a number of exceptional tandems during the 90s, and the pairing of Hakeem Olajuwon and Clyde Drexler was one of them. They made the Rockets a pretty formidable force, and even won themselves two titles, one of them against Payton, Kemp and the Sonics. 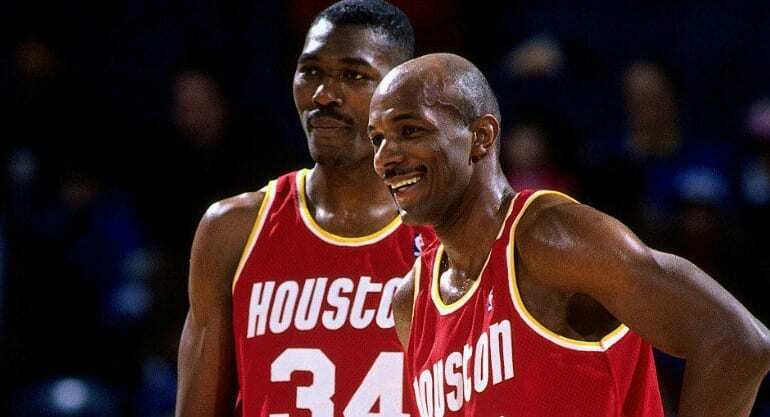 Clyde the “Glyde” and Hakeem will always be remembered as one of those classic “big man-wing” duos, and it goes without saying that they were a huge influence on the future of the league. 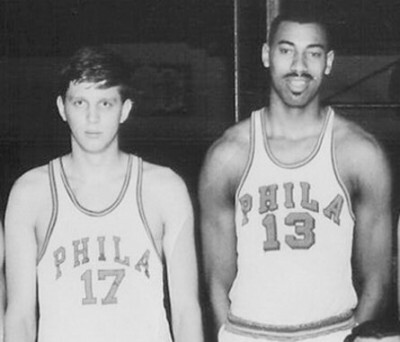 Even though the end of the Paul Arizin’s career overlapped with the start of Wilt’s career, the relatively short amount of time they were together was stellar, to say the least. First of all, let’s just acknowledge that this was a season where these two players combined to score 70 points a game, with Wilt scoring 50 of them. We’re talking one of the greatest stat monsters of all time, combined with a Hall of Famer – the result was basketball dynamite. And of course, how could we leave out none other than Shaq and Kobe? These two both joined the Lakers in 1996, with Shaq signing with them and Kobe coming over through a trade on draft night. Three years later, they won three straight finals in an extremely dominant fashion. Shaq was completely unstoppable in his own right, and then you had a young Kobe Bryant giving the league a taste of Mamba mentality early on – it was just magical. The elixir of life in regards to titles in the 90s, Jordan and Pippen had the pinnacle of basketball success that everyone wanted. Once they had gotten into their stride and started winning titles, they couldn’t stop if they tried. Winning two separate three peats, a total of six championships in the 90s, these guys were out of control. Bulls games were an exciting time for everyone in the league, and to this day, most people still consider Jordan to be the greatest ever.